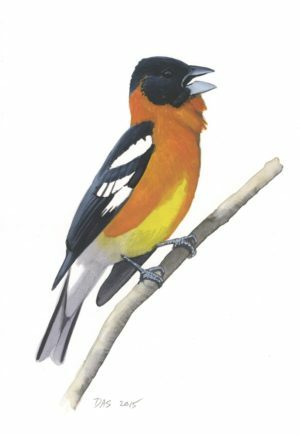 View cart “The Sibley Field Guide to Birds of Eastern North America: Second Edition” has been added to your cart. How can I get a signed (autographed) book? Books that are sold directly through this website can be signed according to your instructions, including a personalized inscription. At checkout you will see a box where you can enter any special instructions for signing or inscription, and I will take care of that before I ship the books. If you would like a signed copy of a book that is not sold here, the easiest way is to check my events schedule and contact the bookstore at one of my upcoming events. Most stores will be happy to take your order for a book with inscription and shipping, and I will sign the book when I am at the store. If you already own a book and would like it signed, you can catch up to me in person at one of my events and I will be happy to sign it. 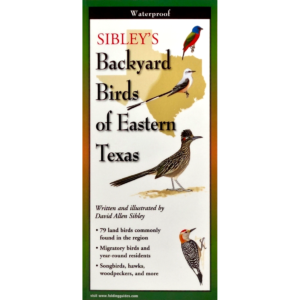 What are the differences between the Sibley Guide to Birds and the Field Guides to Eastern and Western Birds? These books share the same illustrations and maps, and very similar text, differences are mainly in the size of the books and the inclusion of species and variations. Summary: The big guide is more of a reference book and is recommended when you want to have access to all species and as much information as possible about every species. 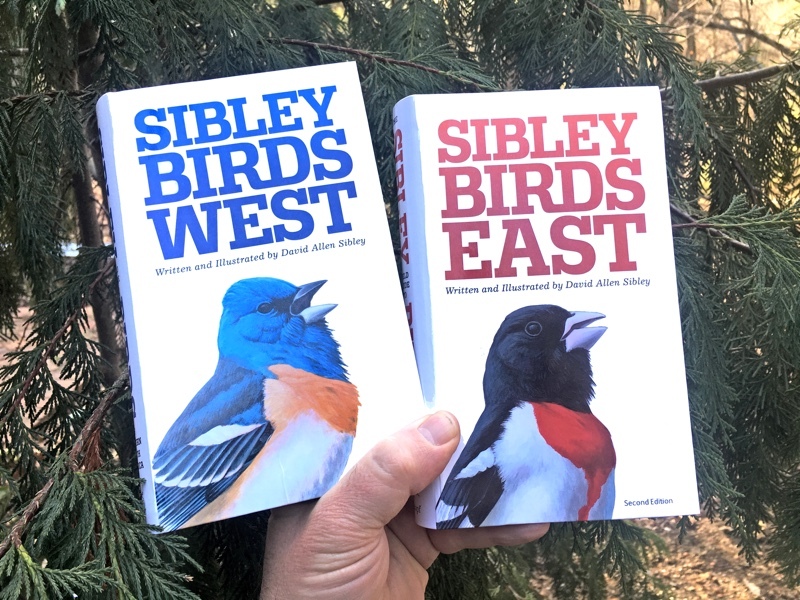 The smaller Eastern and Western Guides are true “Field Guides” and are recommended when you want a more portable size and a book that focuses on the species and variations you are most likely to see. Size: The Eastern and Western guides are much smaller. At just under 5 by 8 inches, and under 1.5 pounds, they will fit into many pockets. The “Big Sibley” is larger at 6.25 by 9.75 inches, and nearly twice as heavy at 2.5 pounds. It will fit in a large jacket pocket, but generally has to be carried in a backpack or other bag. 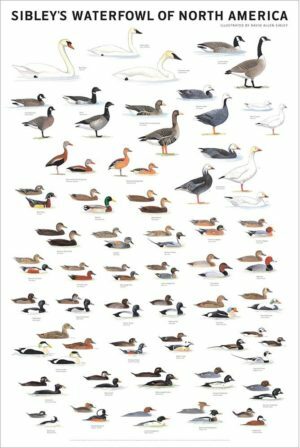 Some benefits of the larger size of the big Bird Guide is that maps are larger (about 10%) and illustrations are larger (variable but up to 20% or more), and there is room for more illustrations and text. 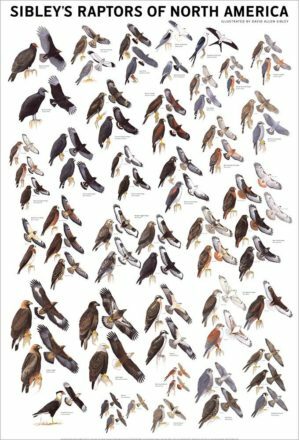 Species included: The big guide covers over 900 species – all of the regularly occurring species (and some rarities) found in North America north of Mexico. 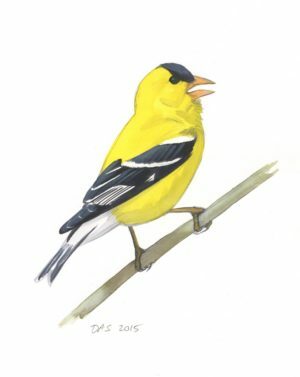 The smaller Field Guides leave out the species that are absent or very rare in that region. 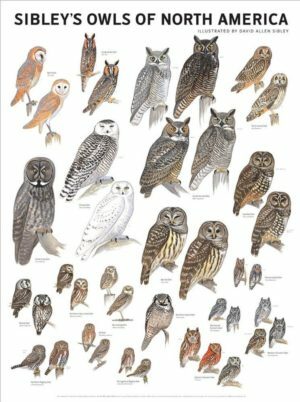 The Western Guide includes about 715 species and the Eastern guide includes about 650 species. 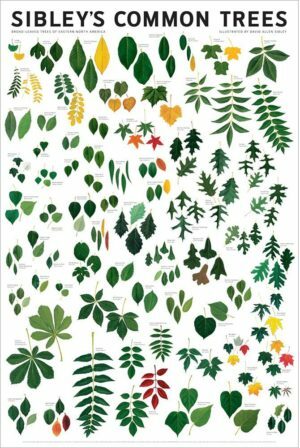 Variations included: To make room for all of those species in a smaller format, the Eastern and Western guides include fewer images of each species. 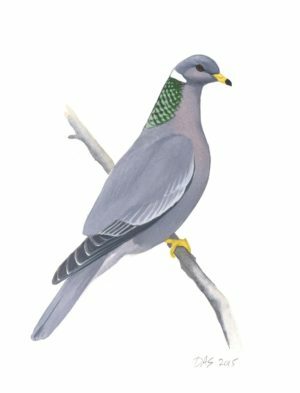 Species that are rare in a region have very limited coverage with only one to three illustrations, and even many common species have the number of illustrations reduced, with some subtle or seldom-seen variations dropped. Differences in content: The text for many species is changed slightly between the three books. Mostly this reflects regional differences in status or other features, but in some cases text was also rewritten to reflect different identification challenges in each region. Some text simply wouldn’t fit in the smaller books and was cut (for example, voice descriptions are shortened), and the sidebar essays on various topics are slightly different among the three books. 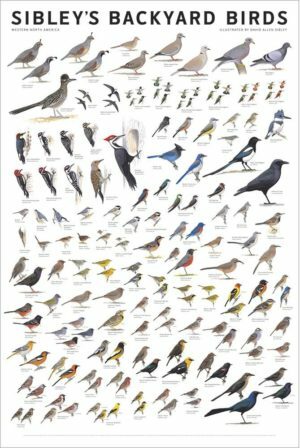 The revised Eastern and Western field guides were published two years later than the big guide, and include several species of introduced exotic birds that are not included in the big guide. 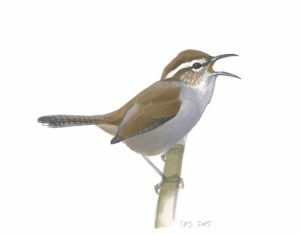 These are primarily found in southern California and Florida: Pin-tailed Whydah, Bronze Mannikin, Orange-cheeked Waxbill, and Cinnamon-rumped Seedeater, and Japanese White-eye. 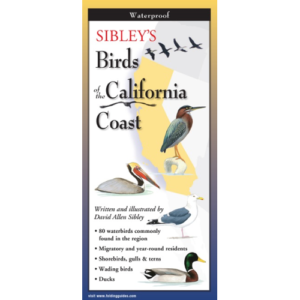 Do the Sibley Guides to Birds include the birds of Hawaii? Mexico? The West Indies? No. 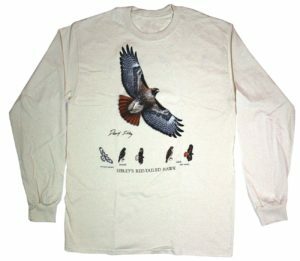 Only species found in the continental US and Canada (north of Mexico) are included. Additional species found in Hawaii, Mexico, the Bahamas, etc. 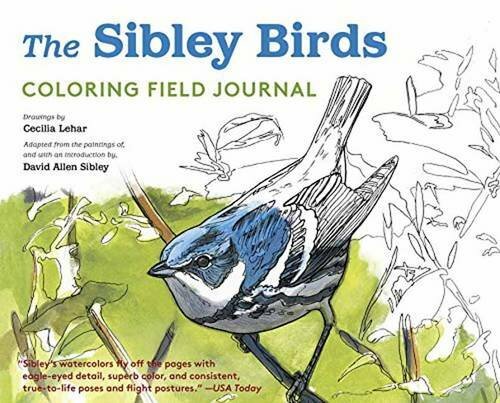 are not included in the Sibley Guide to Birds. I see Sibley Guides for sale elsewhere as “paperback”, “hardcover”, and “flexibound”? Which one should I buy? They are all the same (with one exception). 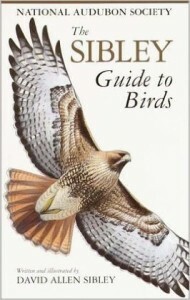 The Sibley Guides to Birds and Trees have only one binding, called “flexibound”. It is a flexible cover, thicker than a typical paperback and extending beyond the page edges. It is intermediate between the traditional “paperback” and “hardcover” styles, and many sellers list it as one of those two categories. Regardless of how it is listed, all copies for sale have the same flexibound cover. The only exception is the Sibley Guide to Bird Life and Behavior, which was originally published in a hardcover binding, but now sold as flexibound. A “flexibound” binding is a flexible cover that is thicker than a typical paperback and extends beyond the page edges. It is intermediate between the traditional “paperback” and “hardcover” styles, and many sellers simply list it as one of those categories, causing some confusion. What’s different in the second edition of the Sibley Guide to Birds? 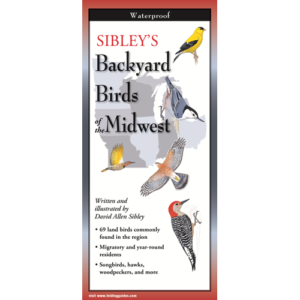 The 2014 Second Edition of the Sibley Guide to Birds is a major update to the original 2000 edition. Information from the publisher Alfred A. Knopf, Inc. 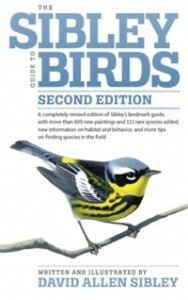 The original (2000) edition of the Sibley Guide to Birds represents more than 12 years of work. 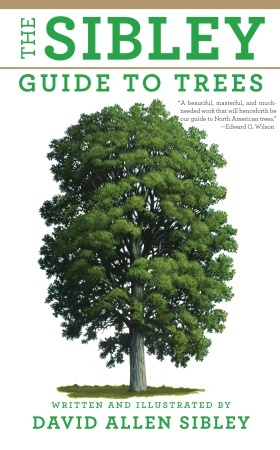 The final draft of the artwork and text took over six years to complete, and the finished book was published in October 2000. Before painting and writing the final draft I spent over 6 years working on the problems of layout and design. 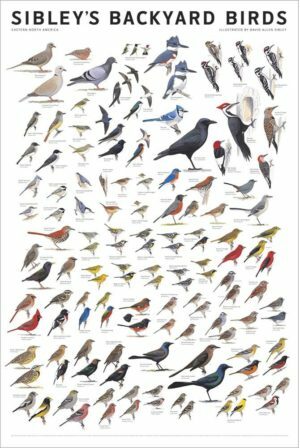 The challenge was to meet the goal of illustrating every species and every significant plumage variation; illustrating every species in flight from above and below; describing the complete range of vocalizations for each species; showing all significant subspecies variations; and doing it all in a format that is logical and easy to understand so that even beginners would not be overwhelmed by the amount of information. The solution was a new and unique design arranging each species in a vertical column on the page. This allows the user to make comparisons easily between different plumages of the same species (by scanning up and down) as well as between similar plumages of different species (by scanning left to right). 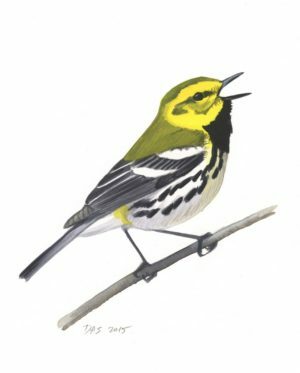 If you’ve seen a drab fall warbler, all you need to do is scan the upper images of each species to see all of the drabbest warblers. 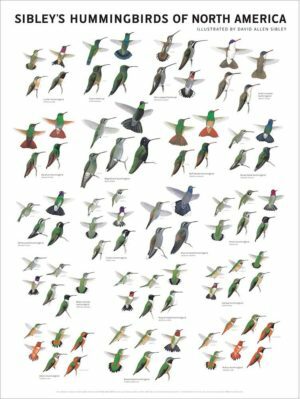 If you’ve seen a woodpecker in flight, a quick horizontal scan across several pages will show all the possibilities at a glance.